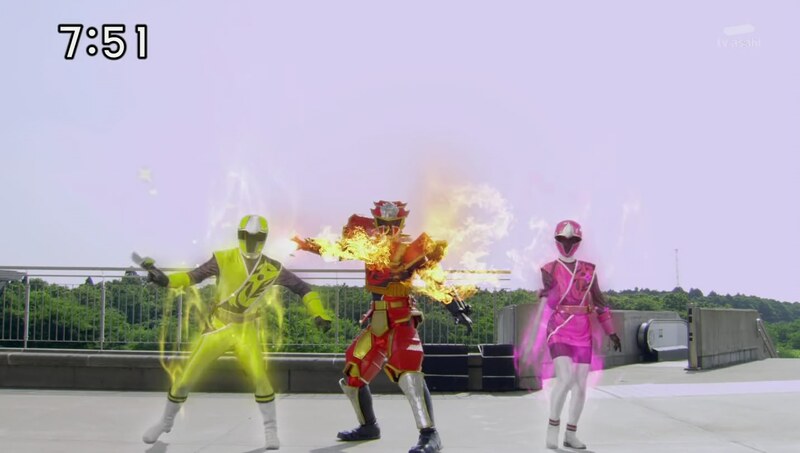 Recap: Shuriken Sentai Ninninger, Episode 24 – It’s Summer! Western Youkai Arrive in Japan! Ariake no Kata introduces the foreign Youkai to Masakage and Kyuuemon: Dracula, Ookami Otoko and Franken. But they each have a request before getting to work. Franken wants to go sightseeing. Kyuuemon offers to take him around. Meanwhile, Father wants to treat the kids to a day off from training. Especially Fuuka who has concentrated on training and schoolwork. 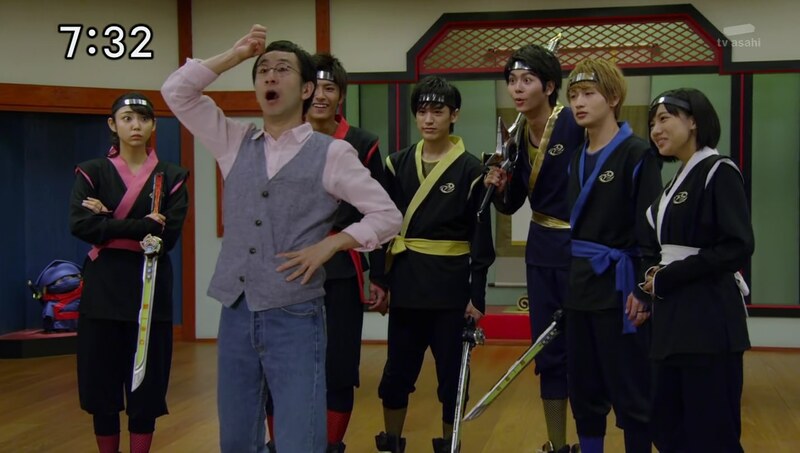 Father offers to take them to a ninja museum, which excites Takaharu and Kinji. But Fuuka says she doesn’t want to spend even her day off thinking about ninja stuff. She says they can all go ahead and she’ll just stay home to finish her homework. 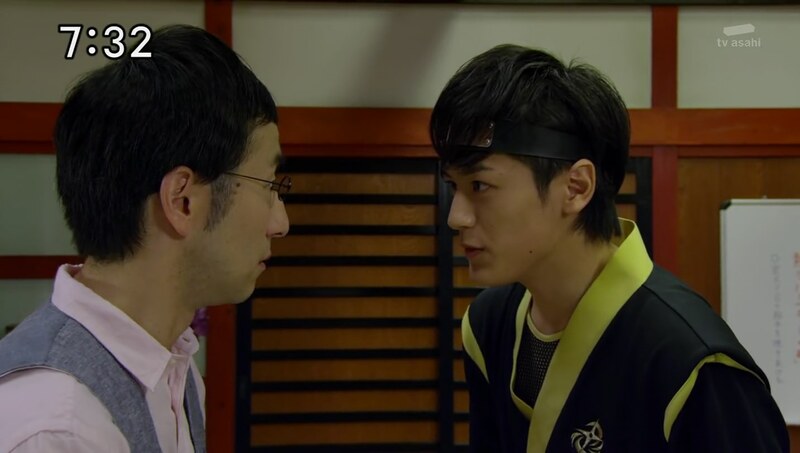 Nagi tells Uncle that he won’t be able to get Fuuka excited about ninja things. He suggests Uncle mention an amusement park. As soon as Uncle does, Fuuka excitedly jumps to her feet. Next day, the family heads to the amusement park. 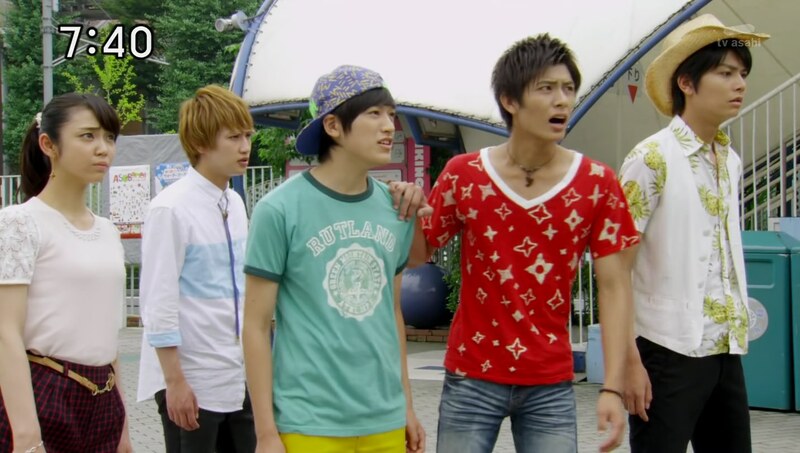 Father wants to go to the haunted house while Takaharu wants to go on a roller coaster. Fuuka wants neither and pulls Kasumi along with her. Nagi explains to Takaharu what Father is trying to do and hands Father a guidebook he’s marked up with things Fuuka might enjoy. Father thanks him and he runs over to Fuuka to show her one of the suggestions. She likes it! Father, Fuuka and Kasumi hurry over to the ride. Nagi and the guys agree they should all help Father with his mission for the day. They hop around the park to see which rides have short lines and relay the info to Father and Fuuka. 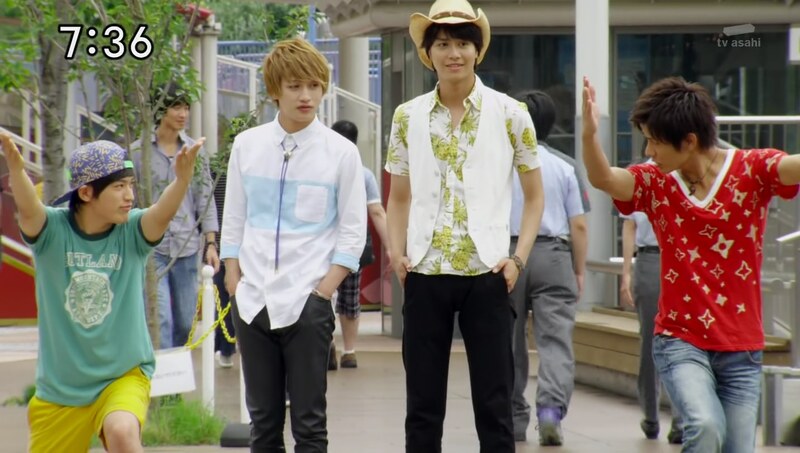 Nagi tells Takaharu and Kasumi to buy some ice cream for them. 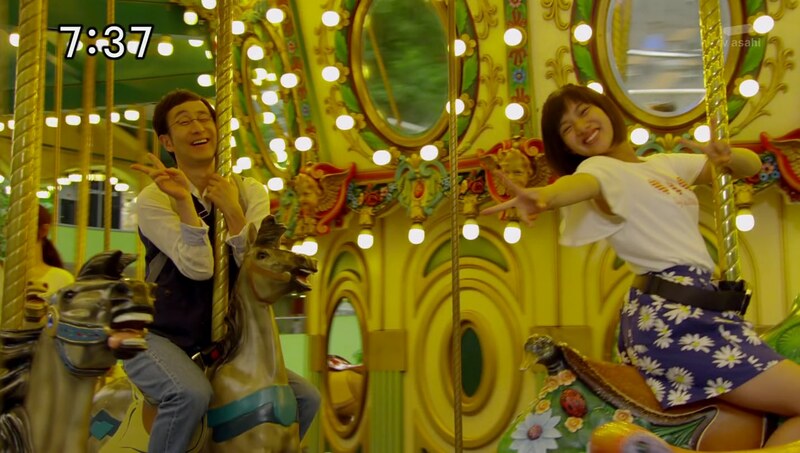 But while the guys play paparazzi for Father and Fuuka on the merry-go-round, a Jukkarage watches. Kyuuemon continues the aerial tour of the city for Franken before they have some sushi. After some shopping, the Jukkarage relays the intel to Kyuuemon and they head to the amusement park. Father asks Fuuka what she wants to do next, but she says she’s a little bored now and hungry and would like to hang out with the others a little. Father sees Nagi has left him a suggestion to take Fuuka out for yakiniku if she gets bored. Fuuka loves yakiniku. Kyuuemon and Franken arrive at the park and Franken is angry that these mechanical things are scaring more people than him. He decides to stop the things mid-ride which scare people even more. Kyuuemon happily collects the fear. The Ninningers, minus Fuuka, hurry over to save the people trapped on the rides. Fuuka calls them over for lunch, but with Franken continuing to stop rides, Takaharu just tells her they’ll be over soon. Kinji recognizes the Youkai from his studies. They decide not to allow this to ruin Father and Fuuka’s fun time. 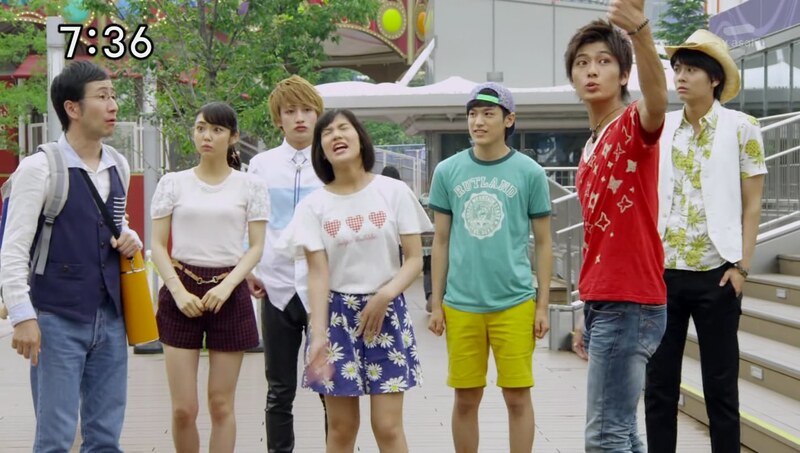 Takaharu tells Kasumi to keep them out of the loop while the guys take care of Franken. Kasumi heads to the restaurant and tells Fuuka and Father that the guys are in line for the roller coaster and they can start without them. Ariake no Kata is a little upset these Western Youkai are acting just like the incompetent Japanese Youkai. Kyuuemon suggests drawing out the Otomo Nin will help fire up Franken. Kyuuemon summons a Gashadokuro and Kinji and Yakkie hop into Bison King Drago. Kasumi tries to distract Father and Fuuka from the strange noises and booms coming from outside. Franken can’t believe there are more machines taking away his scary spotlight. He decides to freeze Bison King Drago as well and Kinji and Yakumo are unable to do anything but absorb the Gashadokuro’s attacks. Ariake no Kata wants Kyuuemon to give her the collected fear from today so she can get a facial, but Kyuuemon refuses. They argue. The commotion is getting louder and both Father and Fuuka are becoming more suspicious. Kasumi tells Fuuka to just order whatever else she wants while she goes to check on the others at the roller coaster. Franken continues knocking the guys around as Kasumi arrives. 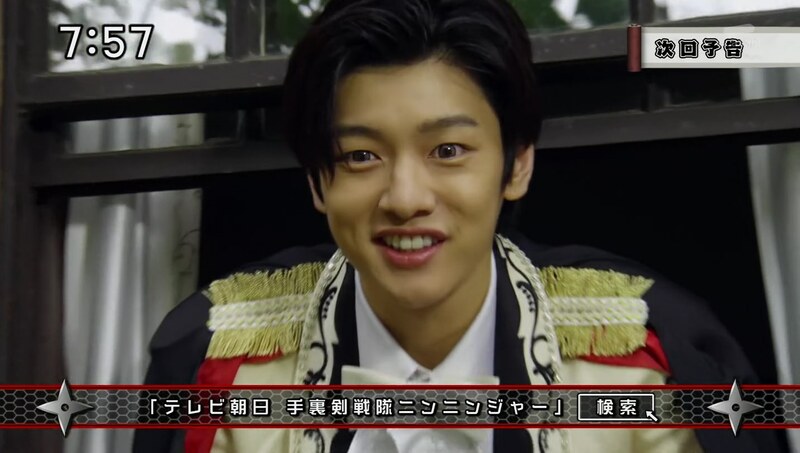 Takaharu says he’ll hop into Shinobimaru so they can finish this quick before Fuuka and Father realize what’s going on. Takaharu summons Surfermaru and then uses Hurricane no Jutsu to take care of the Gashadokuro. But Franken just freezes Shinobimaru too. Takaharu jumps down and goes Chozetsu. Franken tries to freeze him too, but Takaharu manages to hold on. He yells over to Nagi who uses Water Technique to reflect the stop beam back to Franken. Takaharu, Nagi and Kasumi work together to finish off Franken’s first life. Ariake no Kata tells Kyuuemon to embiggen and the Ninningers hop into ShurikenJin which they can do thanks to Kasumi swiping Fuuka’s Nin Shuriken without her knowing. They combine into Ha-Oh ShurikenJin and before finishing off Franken for good, do a roll call in the cockpit with Kasumi filling in for Fuuka. Fuuka and Father head home where everyone else is lounging about in the living room. Fuuka thanks her Father for the great, fun day they had today. 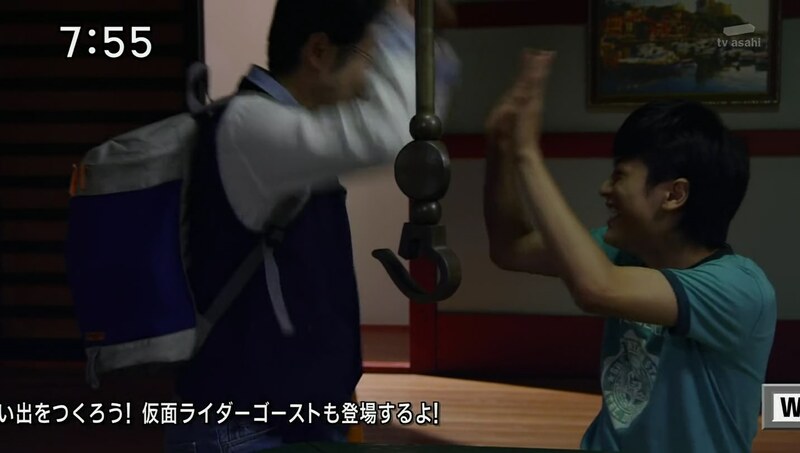 Father thanks Nagi for the help and Takaharu compliments him for his planning today. Meanwhile, the remaining two Western Youkai vow to do better than Franken. This was another fun episode. I am enjoying these “filler” episodes maybe a lot more than the more plot-driven episodes. In this one, we have a nice main plot of Father wanting to spend time with Fuuka. It was a good episode, especially when in the past, we’ve seen Fuuka absolutely (and inexplicably) disgusted by her Father. The cousins working together to allow the father and daughter to have a special day also help flesh out the great relationship they have (which we haven’t seen as much as I would’ve expected by now). 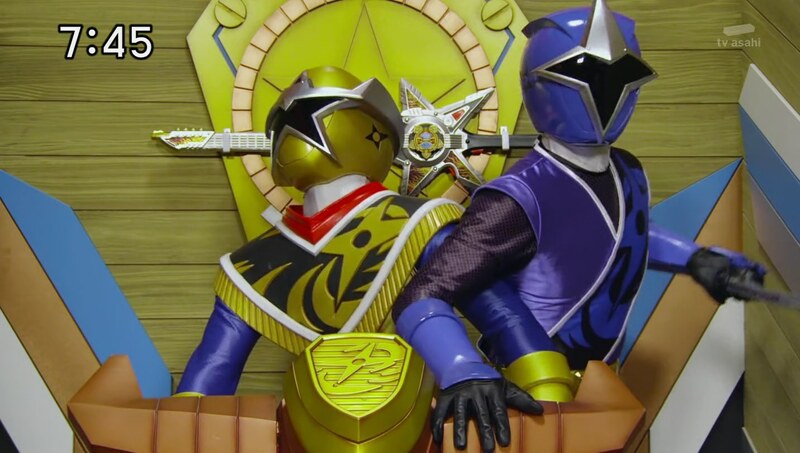 I really hope moving forward, Ninninger can do a little bit more on the relationship side of the story. Watching this episode after watching ToQger Returns a few hours before, the lack of development between the Ninningers’ relationships is very evident. I really expected and hoped that the family angle would allow for another season of strong bonds and relationships, but we haven’t really seen that much. The few times we have seen a focus on their relationships have been the best the show has been. So I really hope that they can step it up in that sense moving forward. Also, I hope the others get to go Chozetsu too. Next week, Cross Gene’s Shin Wonho!